Replacing an old hard drive that has an IDE interface with a new drive using the faster SATA interface can give your computer new life. 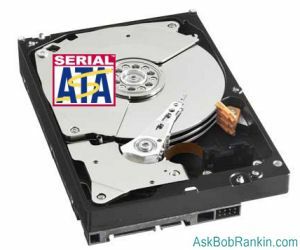 How easy is it to replace an IDE hard drive with a SATA drive? That depends on the interfaces supported by your current motherboard. If your computer was made in 2009 or later, it's almost certain to include SATA interfaces as well as IDE interfaces on its motherboard. Check the specs for your motherboard via the system's user manual or the motherboard maker's website. There have been three versions of the SATA standard. Revision 1 transfers data at 1.5 Gbits/sec. ; Revision 2 does 3 Gbits/sec. ; and Revision 3 hits 6 GBits/sec. You want to buy a SATA hard drive the matches the highest speed of your motherboard's SATA interface. If your old motherboard does not support SATA, you can purchase a PCI-compatible SATA host adapter card for around $30. Plug the adapter into a 16-bit PCI slot on the motherboard, install the SATA software driver that comes with the card, and you're ready for a SATA hard drive. You can also buy a SATA converter adapter that plugs into an IDE port on the motherboard. These are a little cheaper, but I don't recommend this option. I don't have hard data to prove it, but it makes sense that adding a conversion layer to the disk input/output process would have to slow things down somewhat. With the proper SATA hardware and drivers installed, replacing the IDE hard drive with a SATA drive is no different from replacing an IDE drive with another IDE drive. First, decide whether you want to do a clean installation of operating system and applications on the SATA drive, or clone the IDE drive and transfer its image over to the SATA drive. A clean installation avoids copying corrupt or duplicate registry keys and other errors that tend to creep into any hard drive, but it takes a lot of time. Cloning your IDE drive with a product such as Acronis Disk Imaging software is the simplest and fastest technique. The clone (disk image) is stored temporarily on external media such as CD, DVD, or even an external hard drive. See my related article How to Clone a Hard Drive for more on that process. Back up all of your documents, photos, music, data, and other important files to CD, DVD, or an external backup drive. Make sure you have the installation media (CD or downloaded file) for any programs you want to install on the new drive. Remove the IDE drive and install the SATA drive. Allow Windows to format, partition and install the operating system on the SATA drive. Re-install applications and restore your files from the backup. If you've cloned the old drive, just install the SATA, remove the IDE drive and restart your computer. If you want to keep the old IDE drive, enter the BIOS Setup screen at boot time and specify the SATA drive as the first boot drive. This will make sure the computer doesn't try to boot from the IDE drive. Note also that SATA drives do not use the Master/Slave concept. There are no jumpers on SATA drives to specify a master or slave device. So if you have both SATA and IDE drives installed, you might think the IDE should be configured as a Slave. That sounds logical, but it's wrong. Set the jumper on your IDE drive to Master, or the computer may not recognize the IDE drive at all. A SATA drive speeds up read-write operations significantly versus older IDE technology. Even if you have to purchase a SATA host adapter, the performance improvement can be a better investment than buying a whole new, faster computer. Most recent comments on "Replace IDE Hard Drive With SATA Drive"
EDITOR'S NOTE: Formatting and partitioning works the same on SATA. I´ve changed IDE drives for larger ones several times and it is an easy task. My concern right now is the opposite: how to connect my old IDE drives to SATA port in latest motherboards. Any suggestion?? EDITOR'S NOTE: You can buy an adapter card to provide IDE ports. I decided to replace a 5 year old PATA(IDE) drive because it was hesitating. I believed that was a sign of impending failure. The deciding factor was simple. The Sata drives do not come with a cable. Best buy charges $20 for the cable. PATA(IDE) drives also do not come with a cable. I already had one from the old hard drive. It works just fine. The faster Sata was not worth the extra $20 to me. Is it possible to keep the IDE hard drive with the operating system and use a PCI-compatible SATA host adapter card to connect a SATA drive as a second drive. When installing the Sata drive in an XP or Vista system the Sata drivers must be loaded during the installation of the OS. Windows 7 has finally automated this and installs the appropriate drivers automatically. Windows XP requires tapping the F6 key at a certain point during OS installation. Drivers can be copied onto either floppy disk or USB drive. If the F6 prompt is missed the installation must be started again. Windows Vista stops during installation at a page which allows installation of drivers. Just click on the appropriate link, it is self explanatory. I was so thrilled during installation of Win7 to not have to manually install Sata drivers! I just purchased from Office Depot a 1TB 7200 RPM Barracuda and installed it in my 2004 HP A450n. The drive came with the cable, 4-pin-to-SATA power adapter cable (everything I needed to change out my 160GB IDE drive) for just $79.99. It even included a disk management utility that cloned my original drive, among other things. Fantastic deal. I've installed it and it works swimmingly. Danny, hope it all works well for you. I am now dealing with a 1TB Seagate Barracuda that came in a Maxtor Central Axis network drive. The hard drive tanked on me and I am now trying to figure out how to get it all back. A couple of silly questions from someone who understands just enough about computers to be dangerous. Where do I find out the information you referred to in your article. (There have been three versions of the SATA standard. Revision 1 transfers data at 1.5 Gbits/sec. ; Revision 2 does 3 Gbits/sec. ; and Revision 3 hits 6 GBits/sec. You want to buy a SATA hard drive the matches the highest speed of your motherboard's SATA interface.) I need to replace a PATA drive and want to put in a SATA drive and have no idea where the information is on my motherboard. Also, currently, the ATA drive is the boot drive, but most of my information/data/files are on the SATA drive also installed on this computer. How do I designate the new drive as the boot drive when I make the switch? My IDE drive crashed on me & I went & bought a SATA drive & connected it with a host adaptor card but when I try & install windows Vista it says that my hardware may not support booting to this disk. Ensure the Disk's controller is enabled in the computers BIOS menu. If I click next to try install the OS it then says Windows is unable to find a system volume that meets its criteria for installation. Ihave tried to install the drivers from the SATA PCI card but it tells me there are no divice drivers were found, make sure the media contains the correct drivers & press ok.
Do you know how I can solve this problem? If I open my BIOS menu it does not give me the option to set the SATA drive as the primary drive. I cloned a 2TB sata hard drive to replace a 160GB IDE hard drive and installed in my computer (using EASEUS software). Removed the old IDE HD from the computer. When I go to computer and check C drive it still reads 160Gb hard drive info. Why and how do I correct it? SATA HD is connected to the motherboard DATA port. EDITOR'S NOTE: That is odd. Sounds like your BIOS needs to re-detect the hardware. Restart and go into BIOS Setup screens, then look for an option to scan for hard drives. I cloned my sataII 8o gb drive (c:) to another bigger sata II drive (d:) with Paragon and planned to remove the 80 gb drive after that, but it don't work for me - the win7 ultimate runs fine on my bigger disk, but when removing the smaller, I can't access the win7, I have to keep both. I recently changed my MB and CPU.The MB is compatible with sata hd.I presently have a pair of 250 GB IEDE hdd's.I want to change them with a 1 TB sata hdd.I need help with how to proceed.